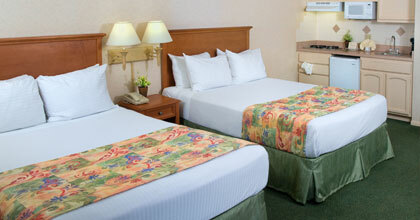 Centrally located and family owned, Old Town Inn offers a variety of clean, affordable rooms and suites. Catering to business and vacation travelers. We are a Non-Smoking hotel, but do offer areas where our smoking guests may smoke outdoors. 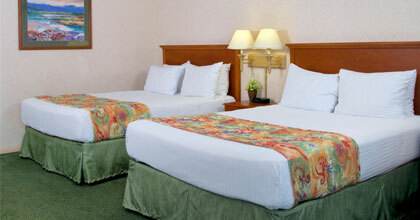 Our rooms are equipped with Flat Screen TVs, DVD players and Simmons Beautyrest Pillowtop mattresses. We also hope you enjoy our outdoor pool surrounded by lush landscaping. Bring your pet! We'll make them feel welcome too. The Old Town Inn is the only place we will stay from now on when we're visiting San Diego! The grounds are beautiful, the rooms super clean, the breakfast is awesome and all members of the staff we encountered were very nice and helpful. Enjoy the same attractive, spacious rooms and suites with all of our listed amenities, plus features catering to guests with special needs. Our mobility accessible rooms have additional clearance on all doorways and between furnishings, with convenient vanities and closets. Our hearing impaired accessible rooms are equipped with a strobe-light smoke alarm, and a door/phone alarm system. If you need additional assistance, please contact our front desk. We will make every effort to accommodate your needs. 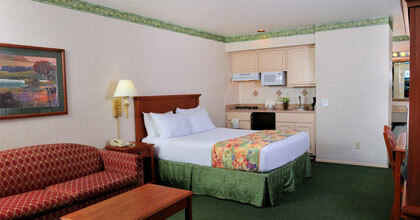 Our oversized guestrooms (325 sq. ft.) feature 2 queen-size beds with pillow-top mattresses, a flat screen TV, telephone, desk area, and a comfortable sitting chair. Ideal for families or couples vacationing. Accommodate up to 4 guests. 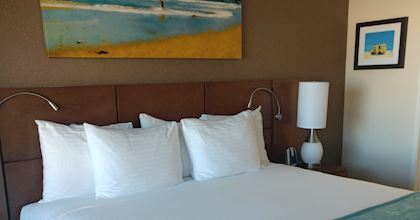 These large guestrooms (325 sq. ft.) feature one king-size bed or two queen-sized beds with a pillow-top mattress, a flat-screen TV, microwave, small refrigerator, telephone, well-lit desk, and a comfortable sofa. Perfect for a romantic escape or stretching out to get your work done. Accommodates up to 2 guests. 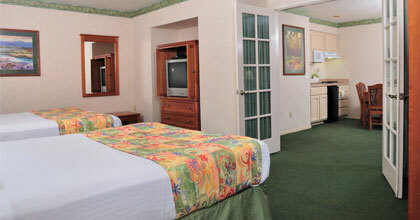 These spacious guestrooms (325 sq. ft.) feature 2 pillow-top queen-size beds, a microwave, 2 -burner cook top, small refrigerator, a 27" TV, telephone, work desk, and a comfortable sitting chair. If needed, we provide a kitchen pack that includes all basic kitchen needs. Accommodates up to 4 guests. These roomy guestrooms (325 sq. ft.) feature 1 pillow-top queen-size bed, a, microwave, 2-burner cook top, small refrigerator, flat-screen TV, telephone, and a comfortable sofaarea. If needed, we provide a kitchen pack that includes all basic kitchen needs. Accommodates up to 2 guests. 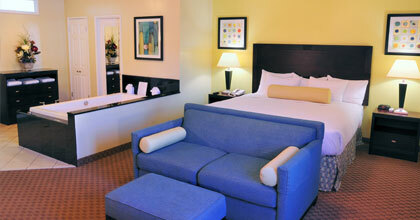 Accommodating up to 6 guests, these large suites (553 sq. ft.) feature a separate bedroom with 2 queen-size beds. There's also a comfortable sofa-bed with 2 sitting chairs in the living room, a kitchenette with a microwave, 2 burner cook top and small refrigerator, 32" flat-screen TV, 2 phones, and a desk. If needed, we provide a kitchen pack that includes all basic kitchen needs. Our newest suite (414 sq. ft.) features a plush king-size bed, large Jacuzzi hot tub, glass shower with standard and rain showerheads, granite counters, a fireplace, 42" flat-screen TV, and sofa seating area. 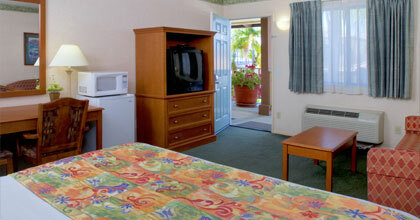 Accommodates up to 2 guests. Book this early, truly one of a kind! Special Note: Pets are not allowed in this guestroom. This spacious guestroom (251 sq. ft.) is great for an extended stay. It features one King sized bed, a separate kitchen with full sized appliances, a 40" flat-screen TV, sofa-sleeper, a work desk and a comfortable sitting area. 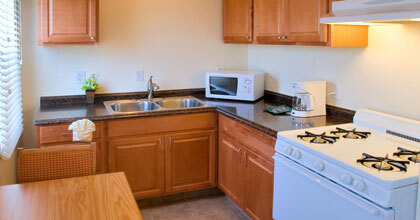 If needed, we provide a kitchen pack that includes all basic kitchen needs.Accommodates up to 4 guests. These cozy (209 sq. ft.) recently remodeled rooms feature a King-size bed with pillow-top mattress, a small fridge, flat-screen TV, and a shower only (no tub). They accommodate up to 2 guests. IMPORTANT: Our Vintage Rooms are located in our original buildings, circa 1940. These buildings are 1-story and 2-stories. Our 2-story building does not have an elevator. If you require a room on the ground floor, please let us know when making your reservation, we do our best to accommodate our guests' special requests. 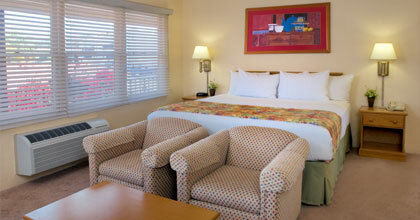 Looking for a short-term apartment or extended-stay hotel? Old Town Inn offers a variety of tastefully appointed guestrooms including spacious guestrooms equipped with kitchenettes or a kitchen with full sized appliances. We also provide a kitchen pack that includes all your basic kitchen equipment. 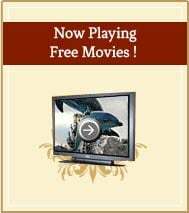 Ideal while your home is being remodeled or if you're visiting San Diego for a winter escape. *Savings available for both medium and long term stays.